Make Money with Clickbank.com updated April 2014. Clickbank sign up as an affiliate is free, so don’t ever pay anyone to use a Clickbank account as an affiliate, if someone asks for money it’s a Clickbank Scam. 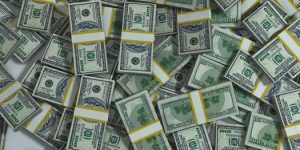 When I first wrote the Clickbank article below (2008) I’d been using Clickbank.com for about 18 months to make money as an affiliate, well that’s over 5 years ago and a lot happens in that time with making money online. Since that time I’ve also tried making money money selling my own Clickbank product: The Stallion SEO theme is sold via Clickbank. If you want to understand Clickbank better, see my Clickbank review which covers using Clickbank as a Clickbank customer (buying Clickbank products), Clickbank affiliate (promoting Clickbank products I didn’t create) and as a Clickbank vendor (selling/promoting my own software product sold and promoted on Clickbank). The WordPress SEO Package I develop (Stallion Responsive) and promote on this website is sold via Clickbank for $200 with a 20% Clickbank affiliate revenue share. 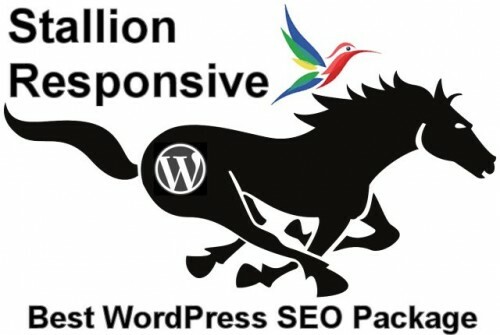 That means you can make money with Clickbank promoting Stallion Responsive on your website. If I added a banner ad here saying “Buy This Awesome Clickbank Product” would you click and buy the product? Probably not, but if I wrote a review why a Clickbank product I use is worth buying, you’d be pre-sold before clicking the affiliate link. If you plan to review my Clickbank product you can download Stallion Responsive and run in Demo mode to test all product features to write a review. Tell you what, any Clickbank affiliate that makes 5 affiliate sales in a 6 month period that do not resort in a refund (or chargeback) and I’ll give them a free Stallion Responsive ID (run the package for free). Since there’s a 60 day refund period with Clickbank you’ll have to wait 60 days after the 5th sale, contact me 60 days after your 5th sale and I’ll send you an ID for free. As a UK Clickbank affiliate I’ve promoted a handful of personally reviewed Clickbank products, I haven’t seriously promoted a Clickbank product in a review format if I didn’t think the product was worth buying: in other words I’ve bought and used the product and recommend others to use it because I think it’s good. This has limited the number of affiliate products I promote, there’s only so many products I actually use. Going all the way back to August 2008 I was making a small amount from Clickbank (just under $500 in August and just over $600 in July). This money was from sales from a few products, (order or two a day) so considering how little effort (after writing the review process) this money is taking, it’s easy money (also doesn’t take a great deal of traffic either). 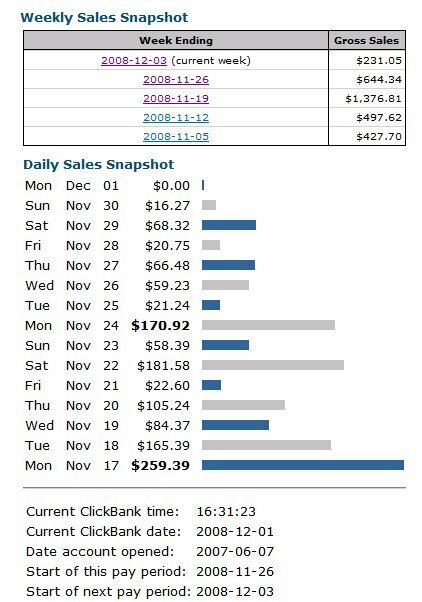 In late 2008 I found a new Clickbank product that I’ve used and reviewed and this one was making a lot more sales than all the others combined. In September 2008 I had my first $200 plus Clickbank days which was a significant increase in affiliate revenue. Now that’s a nice amount of affiliate revenue for something that takes little effort. It’s a total of 63 sales, so on average I’m making $16.50 a sale. I love how Clickbank products have a 50% or more revenue share, finding other affiliates with a decent revenue share is HARD, Amazon affiliate program share is well under 10%, tends to be between 4% and 8%! Would be nice to find an expensive product worth promoting, I was planning to trade Forex in 2008 (in the end I didn’t, though recently started trading UK shares), so was looking into Forex products on Clickbank. Found a Clickbank Forex product that looked interesting, (I think it would have made me a LOT from affiliate sales) but based on a mistake they made in their email marketing it became clear the product was a Clickbank SCAM: basically they are sending out potential earnings for weekends when the stock market etc… is closed! Was tempting to recommend it anyway for the money, but I have my reputation to maintain so said it was a SCAM and wrote Forex Products review. As a personal note I don’t understand how some affiliate Internet marketers who make up positive affiliate reviews get away with it? I have a good memory, but if I wrote just 20 fake positive reviews to promote affiliate products I’d loose track of the lies: even when I’m honest I mix things up (how much I made, time frames etc…)! Reputation is everything online and it’s very easy to damage it and almost impossible to recover it. I had an Internet marketer who had no problem bullshitting their way through making money online and he recommended one of my earlier AdSense Themes Talian 5 (now free) as the go to theme for his autoblog plugin. If you search for his name online his reputation is trashed, just not worth the risk damaging your online reputation! That being said since my name is “David Cameron Law” (David Law) if you check the above names in Google I probably could get away with it since David Cameron is the name of the UK Prime Minister and there’s loads of results for David Law :-) Hmm, the image results for my name are a bit disconcerting!!! You can almost always tell when an affiliate hasn’t used the product they have reviewed, there’s never any meat on the review. Well it’s not by doing what I did between 2009 to 2014. Mostly because of my health problems I pretty much ignored promoting Clickbank products (spent my time dealing with SEO clients and developing the Stallion theme). My Clickbank reviews (mostly on World of Warcraft products) became out of date (stopped playing World of Warcraft) and affiliate sales dried up. Still make a little from Clickbank in 2014, but nothing like what I could be making. To make money now I’d have to write new affiliate product reviews and so far haven’t found the time. The problem with these Clickbank affiliates, is 99% of people can’t get there head around how they work. If some one came up with a 4-5 step Clickbank tutorial how it works and how too well you would make people happy. If you have already written an ebook or have content that can be packaged into an ebook, then one of the ways you might make money online is to give it away or charge very little for it. How can you make money from a free ebook? Easy, you turn it into a viral ebook and have several compelling offers, affiliate links and other ways to make money inside your product. so i cant afford to pay for all these courses and when you get into them anyway they start off chap but then you need to upgrade to get further information that you need. Pleas can you advise.